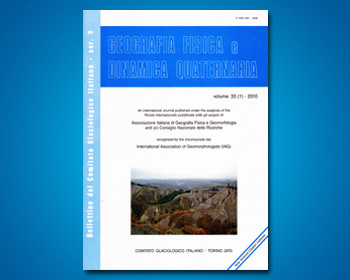 This study was conducted within the framework of the “Coastal Morphodynamics” Working Group (WG) of the Italian Association of Physical Geography and Geomorphology (AIGeo), according to the Institute for the Protection and Environmental Research (ISPRA) for the updating of the legend for the “Geomorphological Map of Italy”. The WG deals with the legend for the coastal areas, focusing its work on marine, lagoon and aeolian landforms, processes and deposits. In particular, the legend aims to classify coastal landforms in order to contribute to hazard and risk assessment, for supporting land-use planning and management. The legend allows the mapping of each landform in function of its genesis as well as its evolution and present dynamics, providing information about morphological characteristics at small and large scales. The relict morphological features and the active ones are reported along with the quantitative parameters useful for the description of the present wave/climate conditions and morphodynamics. As a result of the activities and experiments carried out by the “Coastal Morphodynamics” AIGeo WG during the last years, some examples of coastal geomorphological mappings at different scales (1:5,000 and 1:25,000) have been developed and are presented in this paper. The maps focus both on littoral plains and rocky coast dynamics as well as on the interactions with anthropic modifications.